When it comes to entertaining, make it easy on yourself with my How To Host A Tapas Party guide! From recipes to tips on how to pull it all together without driving yourself insane, this is part one of a handy how-to that you definitely need to save for your next gathering. Well I love all food that I can graze on, to be specific. The idea of loading up a plate with tons of flavors and textures always peaks my interest, and any excuse to gather a bunch of people together around a feast of delicious food has my heart. 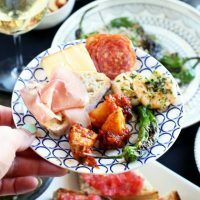 I’ve been wanting to throw a tapas party for a while, but I always delayed it because I was never sure where to start. It seemed a little intimidating from all the cookbooks and various online articles, with complicated recipes that left me wondering why I should even bother. Instead of running away from the idea, I decided to embrace it. 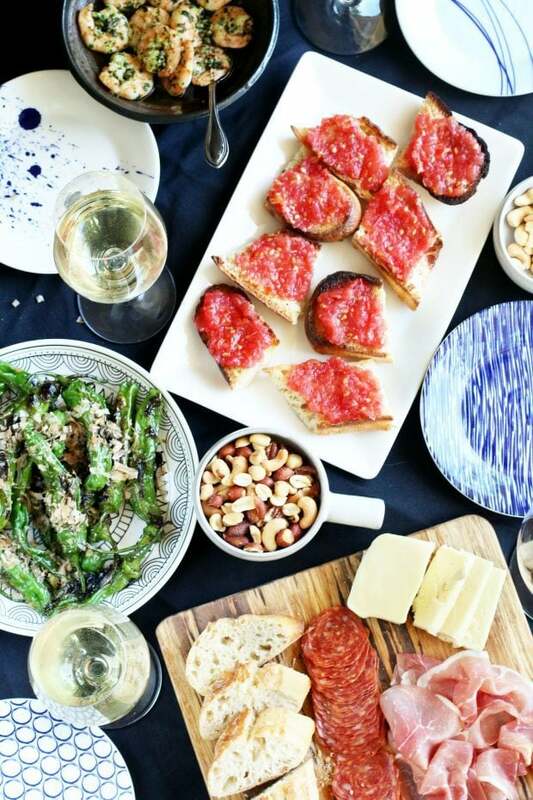 I mean, I can’t possibly be the only one who wants to host a tapas party without driving themselves insane, right? 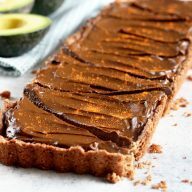 SO, I went on a hunt for the best combination of recipes and bites. 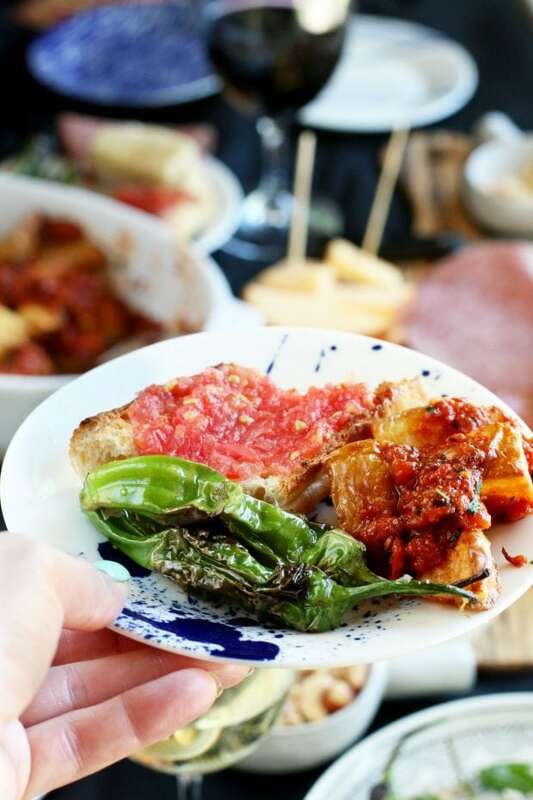 I pulled together the things I learned and I am compiling them for a comprehensive guide to those of you who want to throw a tapas bash! You want to make sure that you have about 4 options for small bites that people can choose from. Now I don’t include a meat/cheese board in this. These small bites are the ones you have to cook to create, therefore I like to stick to the simple, easy, and traditional recipes. 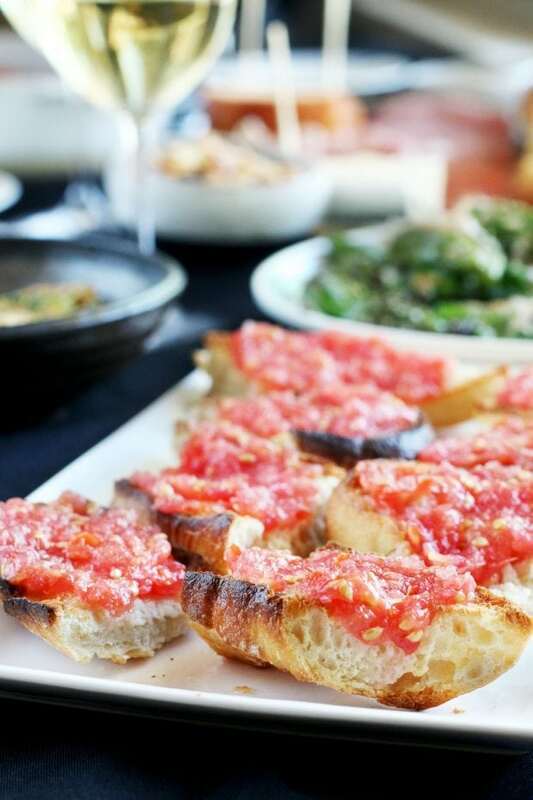 I don’t do this just to be “authentic” to the idea of tapas, or to get up on my high horse to lecture people about food. I do it to make it just a little easier on myself as a host. That way the food doesn’t suffer, and neither do you. 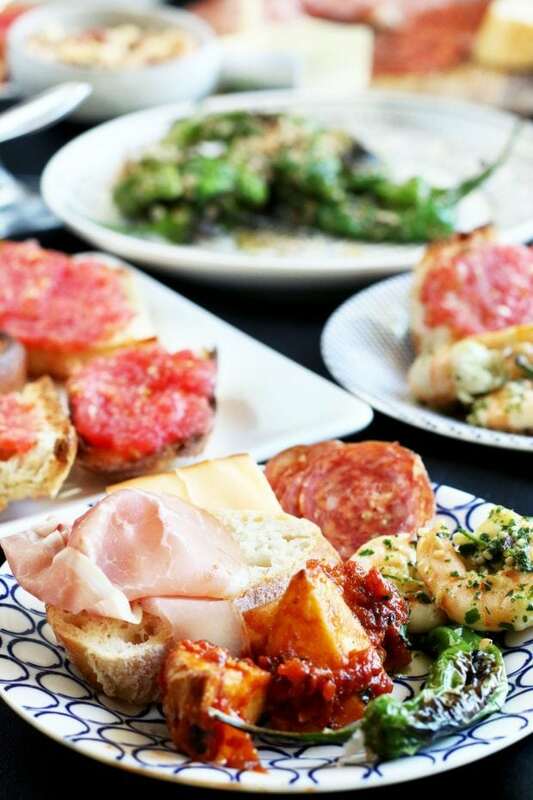 You want to be able to enjoy your time with the people that you’ve gathered together to enjoy this tapas party, don’t you? Keep the simple recipes on deck for this one. In the next post (part two) I’ll be sharing a couple more recipes with you all so that you can master this menu easily. 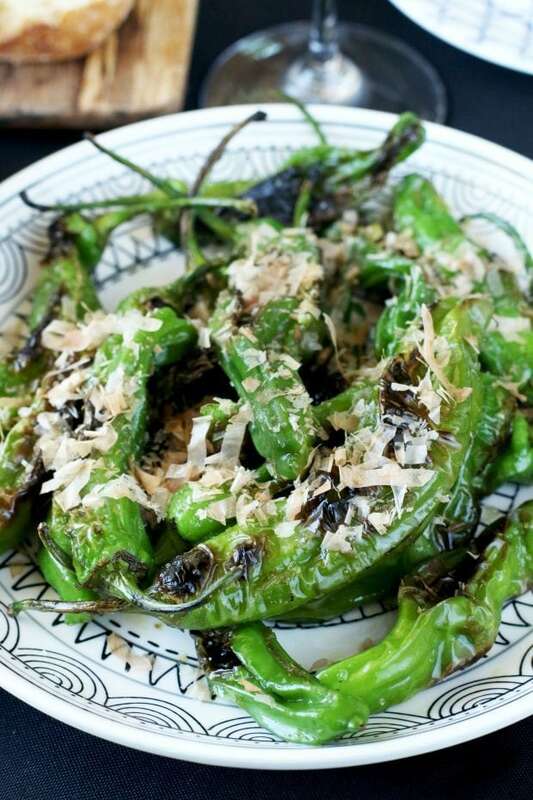 Here you’ll find the blistered shishito peppers with bonito flakes (based off a recipe I had in Asheville many years ago on a foodie trip with my mom) and pan con tomate (a stupid simple recipe that packs a bunch of flavor despite the limited ingredients). The key is to find a balance on the table of meat and vegetarian options so every bite isn’t super heavy, or too light. First, it doesn’t require cooking. That’s a HUGE win in my opinion, because you are already going to be spending time cooking a couple of other bites. No need to overload the stove – it’s not Thanksgiving after all! 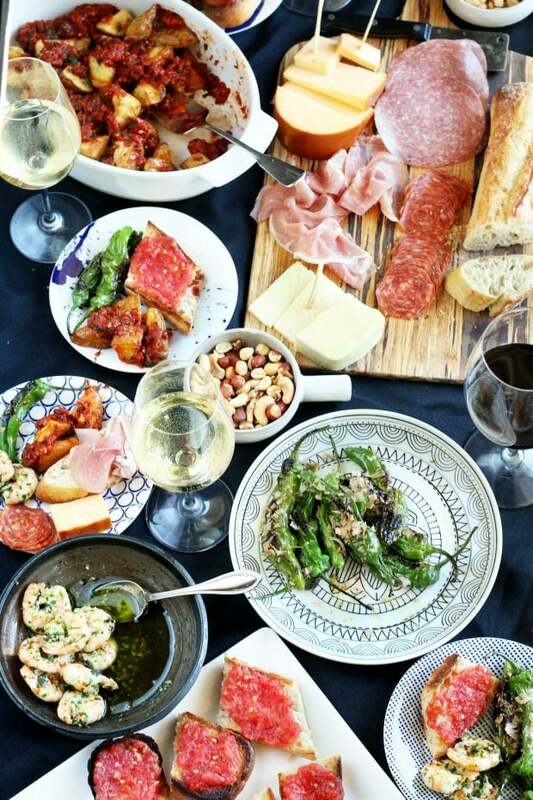 Second, any type of board is easy to set out and let people nibble on as you are wrapping up the final dishes of the spread. I don’t know about you, but I have a couple of friends who are either a) always early or b) annoyingly on time. So, when those folks show up when you aren’t quite done, you have something to ebb their hunger and keep them busy. Just be sure to balance the boards with different elements. 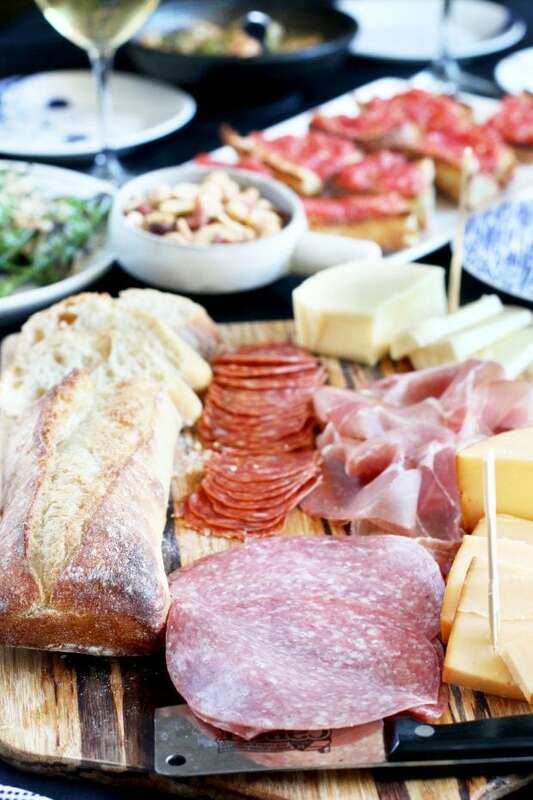 You can make an authentic meat and cheese board featuring Spanish favorites like chorizo and serrano ham. You can simply make a spread with what you have in your refrigerator, or gather together your all-time favorites. Need some inspiration on the boards? Check out my various seasonal boards here! Once you have your menu set, it’s time to go grocery shopping. I know, it’s our favorite thing in the world to do, isn’t it? I have a very specific method when I grocery shop, and that’s making two lists. First, I start with the list of everything I will need. I go through all the recipes I want to make, I think about the little extras like bread and nuts to add to the table, and I make sure that my list is thorough. After I have everything written down on paper, I grab another piece of paper to make the final list. That final list is divided by department. I know this might sound like extra work, but I HATE wasting time in the grocery store. No matter when I go, it’s always packed and I prefer to spend my time doing things other than grocery shopping. So, if you divide up your list by department, you’ll be able to go through the store easily. I swear, you’ll make it out of there in half the time it usually takes! 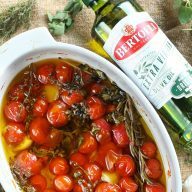 Now that you are armed with a few tips, I am going to leave you until the next post so I don’t completely overload you with information and recipes. Stay tuned for part two of this how-to guide later this week!
. I LOVE that they are all different and the six plates in the set are the perfect size for this party! Le Creuset Signature Iron Handle Skillet to make the blistered shishito peppers expertly. 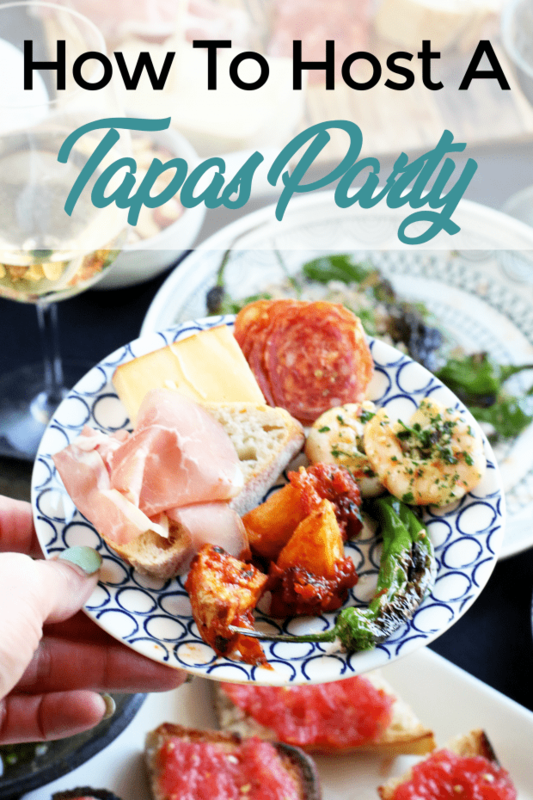 Pin this How To Host A Tapas Party (Part One) for later! 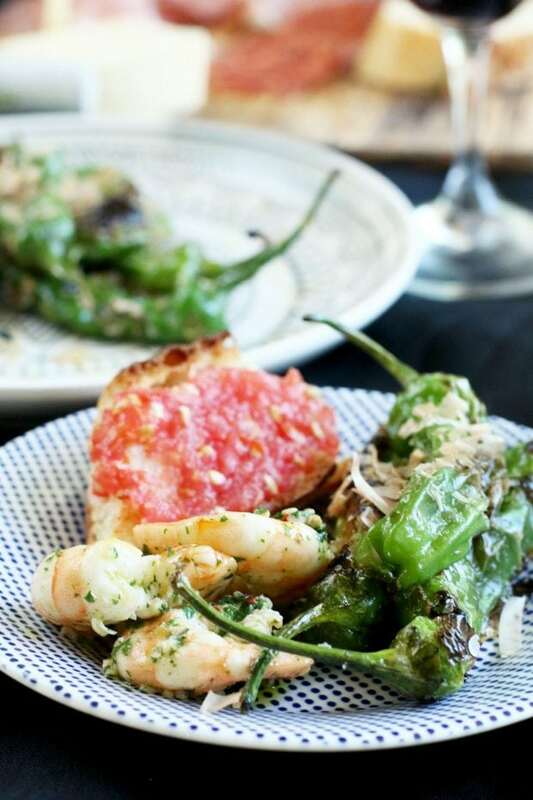 These two simple tapas recipes are some of the easiest to make, and some of the most flavorful. When paired with wine and a couple of other bites, you have a party on your hands! In a medium bowl, toss peppers with oil, lime zest, lime juice, and sea salt. Heat a cast iron skillet over medium high heat. Once hot, add peppers and cook until they are blistered, approximately 4 to 5 minutes. Remove from heat and add to a serving bowl. 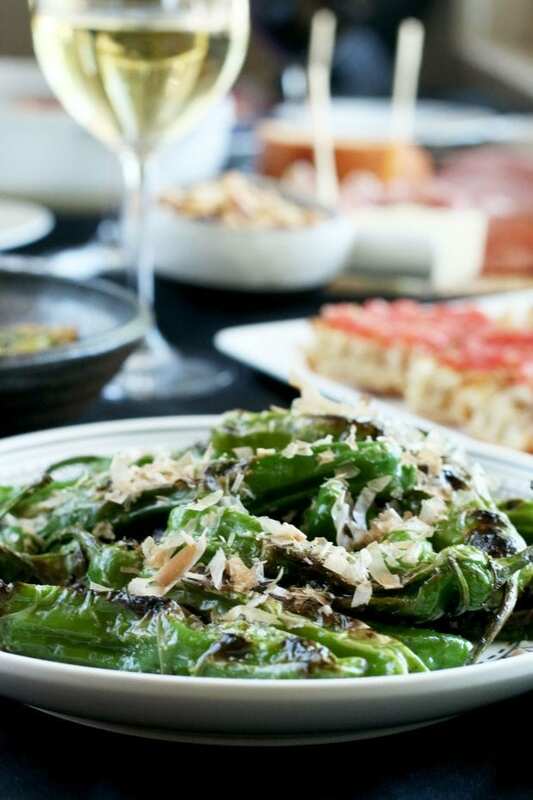 Sprinkle with bonito flakes and serve immediately. Add bread to a baking sheet and toast until golden brown, about 8 minutes. Rub the bread halves with garlic and drizzle evenly with oil. Set aside. Use a coarse grater to grate the tomato into a medium bowl. Discard skin and spoon grated tomato on toast. Sprinkle with salt and cut each half into three pieces. Add to serving platter and serve immediately. You are speaking my language! 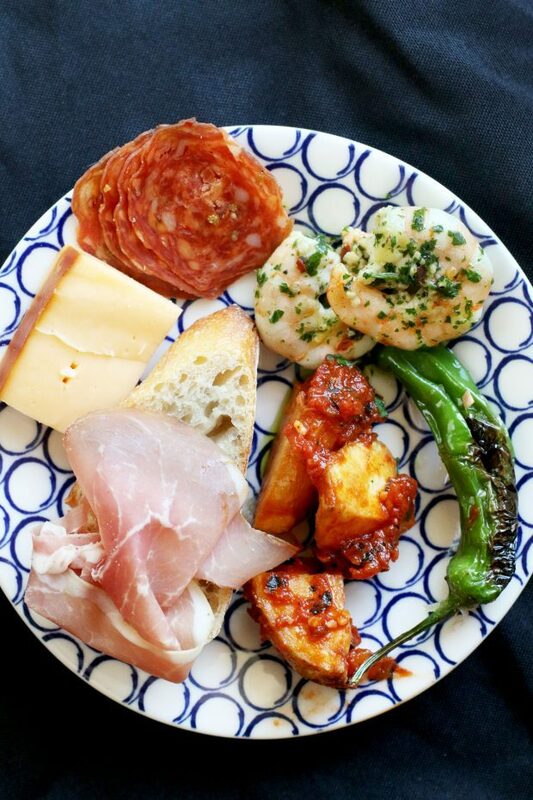 Tapas parties are the best! I love your tips on how to start. It can be intimidating! Looks like the perfect excuse to throw a party! Yum!! Such a great tip about organizing your shopping list. Saves you time and energy! 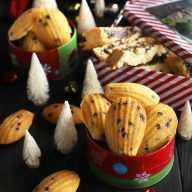 These are great for parties! Ooooh! I love this party idea! So much delicious food! Great ideas! I love tapas! OH! Maybe I will do this for my next dinner party! Thank you for the inspiration!